GUESSING GAME: Who will make the first competitive Peterborough United starting line-up? Anthony Grant appears to be ahead of Chris Forrester in the Posh pecking order. Manager Grant McCann reckons there are still first-team places up for grabs for Peterborough United’s opening League One fixture at home to Plymouth on August 5. 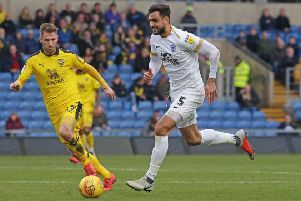 But Posh fans might get some idea of his plans when McCann sends his team out for the final friendly of the summer at League Two side Cheltenham this Saturday (July 29). Gwion Edwards is likely to start the League One season as a wing back. With just a week to the big kick-off, the time for experimenting is surely over. Obviously another signing - and Posh are believed to be close to revealing a new name - would make a difference, but here is the team I expect would start against Plymouth should that particular deal fall through. Marcus Maddison might have left Posh before the start of the League One season. Striker Ricky Miller’s six-game ban at the start of the season makes one of McCann’s team selections easy. Miller’s pre-season form would have made him a strong candidate to start the first League One match of the season against Plymouth. Now, barring any late signings, Jack Marriott and Junior Morias will lead the attack against Argyle. It’s likely McCann will start with his ‘Chelsea’ formation of three centre-backs and two wing-backs, even if Posh have no natural wing-back performers in their squad. Midfielders Gwion Edwards and Leo Da Silva Lopes will fill the roles with Steven Taylor possibly nudging Andrew Hughes out of one of the centre-back slots. Anthony Grant appears ahead of Chris Forrester for a midfield place. Marcus Maddison will play if he is still at the club.